It’s been a while since I have written anything about Game of Thrones/A Song of Ice and Fire. I have been struggling to figure out what to talk about. Then the other day Kelly and I were talking, and it occurred to me that Donald Trump and Cersei Lannister actually have quite a bit in common. Separated at Birth? Wait, no. That’s just gross. Never mind. Follow my logic, if you will. Queen you shall be… until there comes another, younger and more beautiful, to cast you down and take all that you hold dear. So the answer was in front of us all the time, at least for Cersei. Third: both Cersei and Trump are petty, vindictive, and vicious, particularly when it comes to people that they believe have wronged them. Trump cannot seem to let go of any sort of perceived personal slight. He almost always feels a need to respond via Twitter (usually at the wee hours of the morning) and then goes on and on about whatever is bothering him long after many, perhaps even most, other people have stopped caring. The recent mess with both the 2016 popular vote and the size of the crowds at his inauguration both point to this narcissistic obsession with always being the perceived winner. Like Trump, Cersei is obsessed with perceived slights. At her son’s wedding, she is so obsessed with what she sees as Marjorie Tyrell’s perceived threat to her power that she secretly undermines Marjorie’s wishes to help the poor by sending the leftovers from the wedding to the dog kennels instead. She is constantly trying to play Machiavellian-style politics in the capital, and while she is frequently successful, she also does things without thinking of the long-term consequences. She is also so angry about anyone disrespecting her that she sends the zombified Gregor Clegane out to kill some idiot in Flea Bottom who trash talks her early in Season Six. I doubt he is the only one to die for offending her. 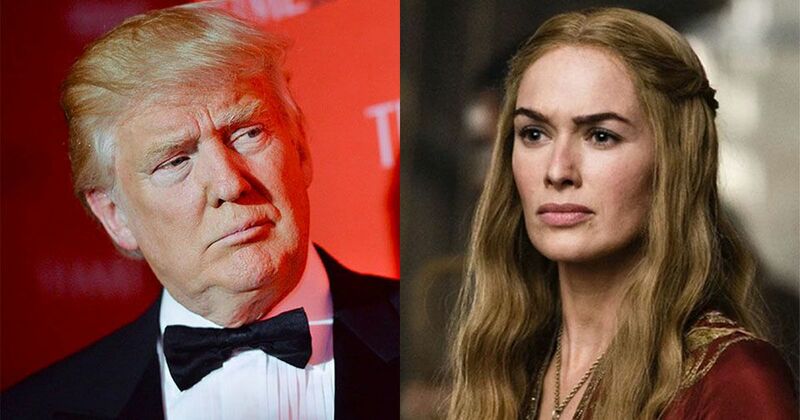 Fourth, although they are both perceived to be very wealthy, neither Trump nor Cersei are actually as rich as most people think. We don’t know how much Trump is worth, really, although evidence seems to suggest that he overestimates how much he is worth. We can’t really know what he is worth because Trump still refuses to release his tax returns, even after he promised to do so if he was elected. And those tax returns would certainly show us how much he was actually worth, not to mention how much he was in debt, especially to Russian oligarchs. In Westeros, Tywin Lannister admitted to his shocked children that the famous Lannister gold mines had actually run dry several years ago. Cersei: A Lannister pays his debts. Pycelle: The Braavosi have a saying too. The Iron Bank will have its due, they say. It is after Cersei stops payments to the Iron Bank that the Iron Bank funds Stannis Baratheon instead. Of course, that doesn’t save Stannis in the long run. Sixth, both Cersei and Trump have complicated and dysfunctional relationships with their families, including some seriously creepy and inappropriate behavior of a sexual nature. In Cersei’s case, she hates her younger brother Tyrion, desperately wants her father Tywin’s approval, sees her children largely as extensions of herself (and is largely responsible for how awful Joffrey turns out), and has illicit sexual relationships with both her brother, Jaime, and her cousin, Lancel. Cersei’s machinations are ultimately responsible for the deaths of Joffrey and Tommen, who both die as child-kings, just as the prophecy had predicted. Trump, on the other hand, depended on his father quite a bit financially, as Fred Trump bailed out his son on a number of occasions, much more so than Trump is willing to admit, apparently. And Trump did not have a good relationship with his brother Freddy Jr., who died at an early age of alcoholism. In fact, Trump helped craft his father’s will in such a way that Freddy’s heirs were left out. Trump seems to have brow-beaten his sons into being a lot like him, but his favorite child seems to be his elder daughter Ivanka. And the way he relates to her is a bit… odd… to put it mildly. So, my fellow GoT/ASOIAF fans, tell me. Am I wrong? While they are not perfect reflections of each other, they certainly have a lot in common. We still have many months until Season Seven debuts on HBO, and in the meantime we can watch the ongoing horror show that is our own country run by a narcissistic sociopath and his neo-Nazi adviser(s). Perhaps delving into comparisons from Westeros will soften the body blows a bit.